See here part of the FCCC Newsletter. Gilbert is one of the “18 Flemish companies”. In the book “FCCC Members’ Portraits in China”, the Chamber presents the activities of 18 Flemish companies which have already made it in China. The book contains valuable information on how they tackled the highly competitive and difficult Chinese market. The man or woman on the ground in China also reveals tips and tricks about doing business in China, based on his or her experience in China. The managers who pulled of the success story of their companies in China also list their favorite book about China, there favorite restaurant in China and their favorite place in China, presenting the reader a lot of tips on books, restaurants and places. Managers of member companies of the Flanders-China Chamber of Commerce based in China are doing an excellent job. Unfortunately, not much of their achievements filters through in the mainstream press. Some are responsible for the business of tens of wholly-owned companies and joint ventures. Others founded their own consultancy and have barely a few employees. Some have been in China for more than 20 years, have married Chinese women and have made the Middle Kingdom there second home. Others have done stints of three or four years in the country, coming from another assignment abroad and moving on to the next stage in their expatriate career. Diverse as those managers are, do they have anything in common? The interviews show that they are all very dedicated and hard working. They make it a point of honor to listen to their Chinese colleagues and employees. They don’t come to China with a fixed and arrogant attitude. On the contrary, they are flexible and quickly adapt to the Chinese business world. That is one of the main reasons why they are successful. Read the book and find out the details. As many of the managers in this book explain, doing business in China is not that different from doing business elsewhere. To be successful and make a profit you have to do your homework. 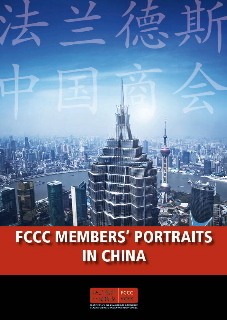 “FCCC Members’ Portraits in China” shows how they did it. The price of the China Guide is €50, including a complementary copy of FCCC Members’ Portraits. FCCC members can also receive a free copy of FCCC Members’ Portraits separately. The guide to doing business in China and the FCCC Members’ Portraits can be ordered via www.flanders-china.be.